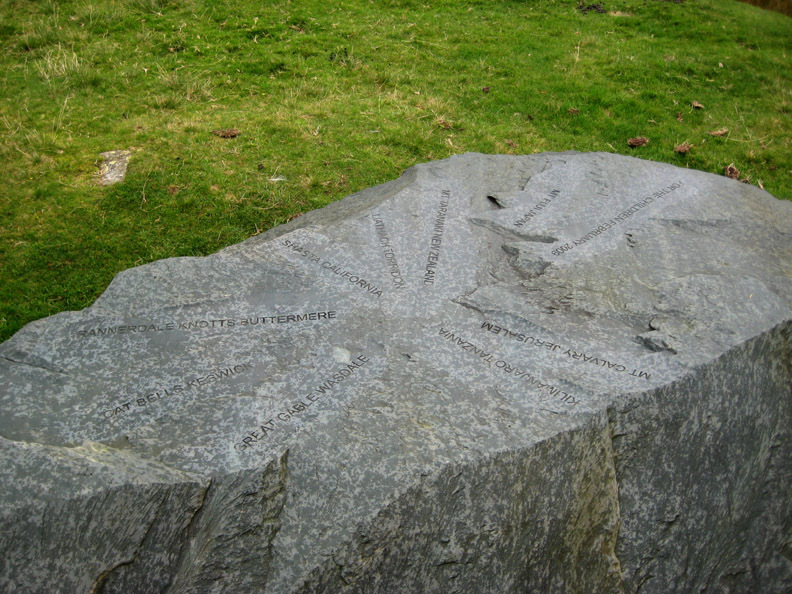 Date & start time: Sunday 6th September 2009. 12 noon start. 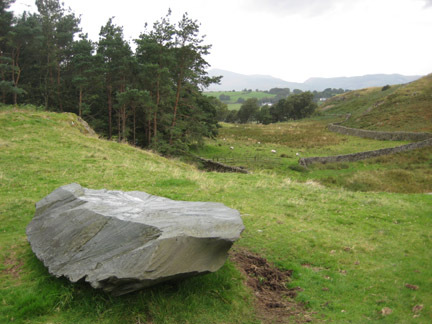 Places visited : Wren Crag, High Rigg, St John's Church, Low Bridgend Farm and back to the A591. 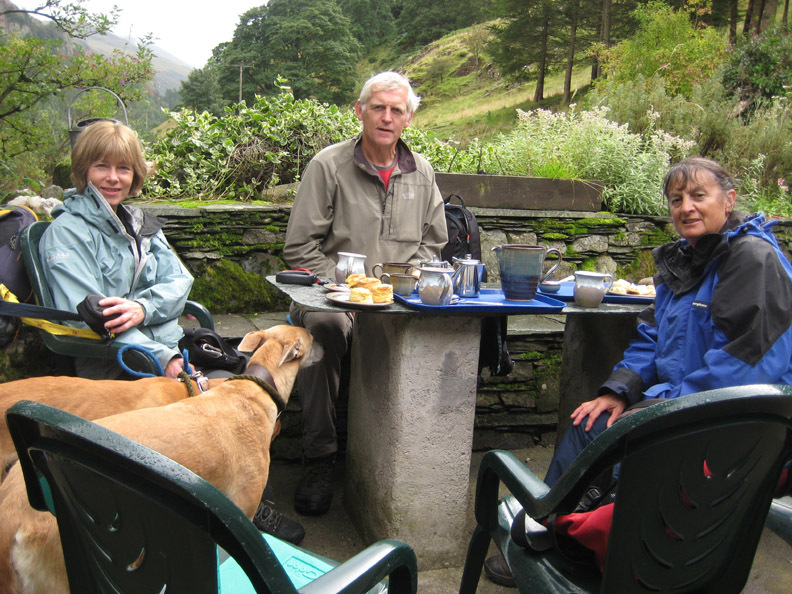 Walk details : 4.9 mls, 1200 ft, 4 hrs 45 mins including lunch and afternoon tea ! 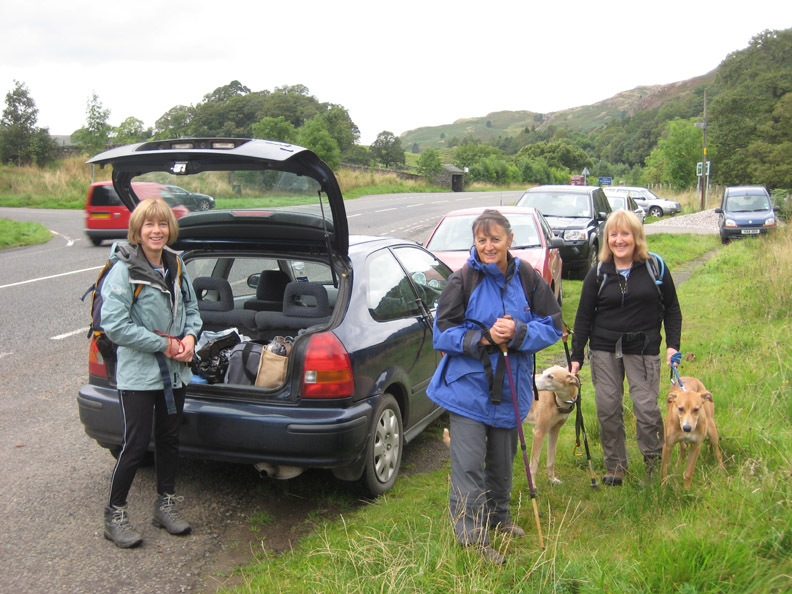 Walked with : Helen, Jo, Ann and the dogs, Jodie, Amber, Harry and Bethan. Weather : Grey and very overcast, occasionally damp. 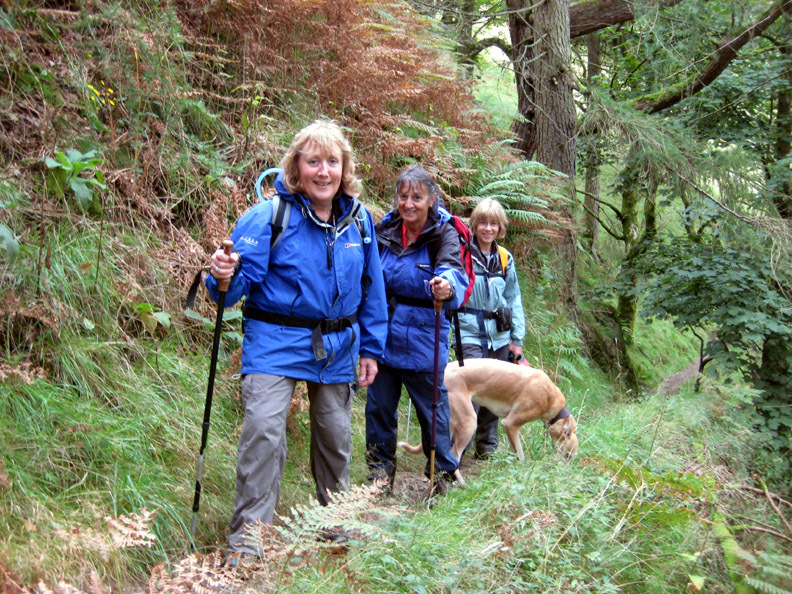 A poor weather forecast led to the choice of a low level walk as we took Ann's school friend Helen onto High Rigg. 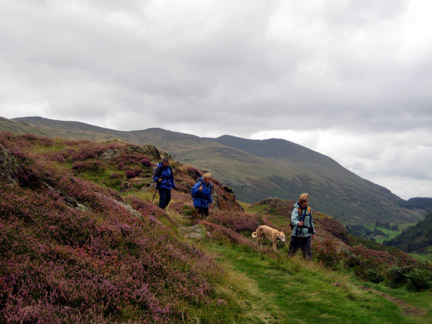 Despite it's name it only reaches 1,160 ft . . . and has the added attraction of a tearoom close to the end of this circular trip. 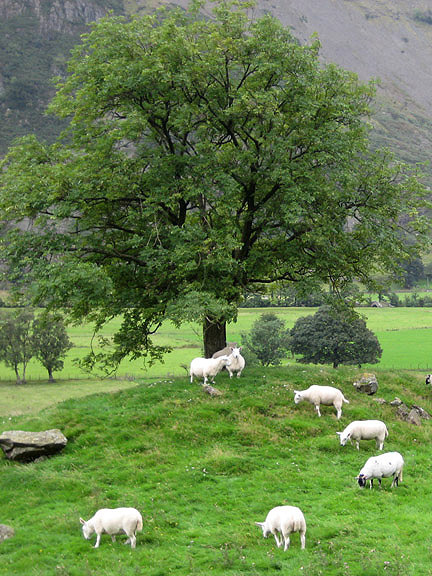 Roadside parking where the St John's Beck, the main river out of Thirlmere Reservoir crosses under the A591. 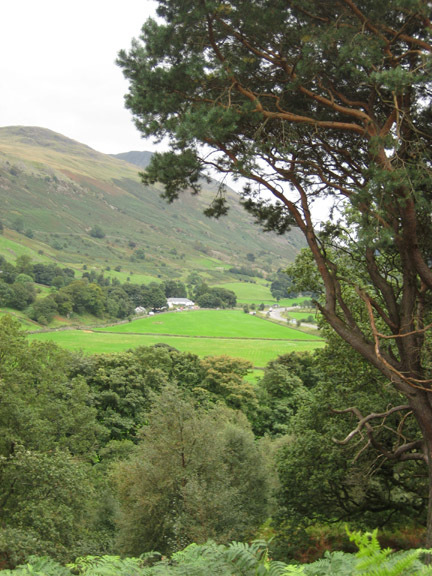 The old road, now a designated cycle track, crosses the valley from the signpost behind us over to the picnic area in Legburthwaite. 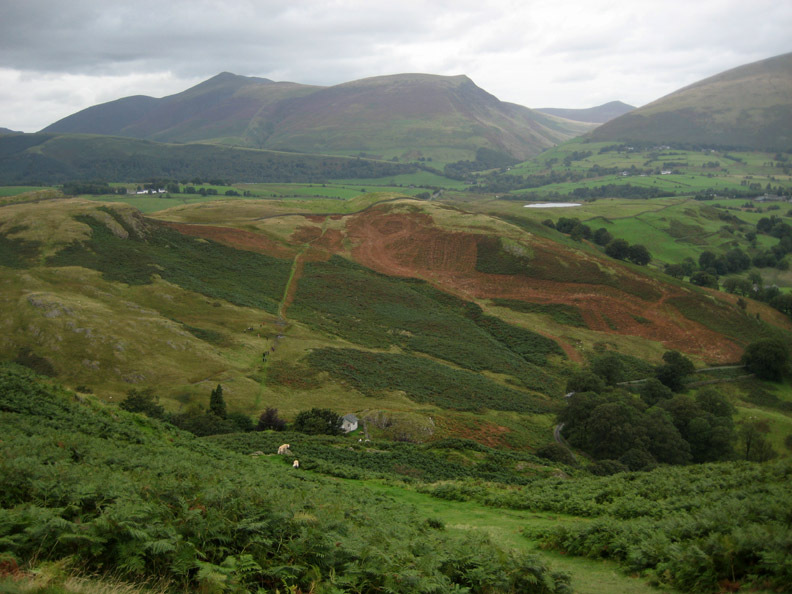 We will be climbing High Rigg (seen to the right of the picture) from the more unusual southern end. 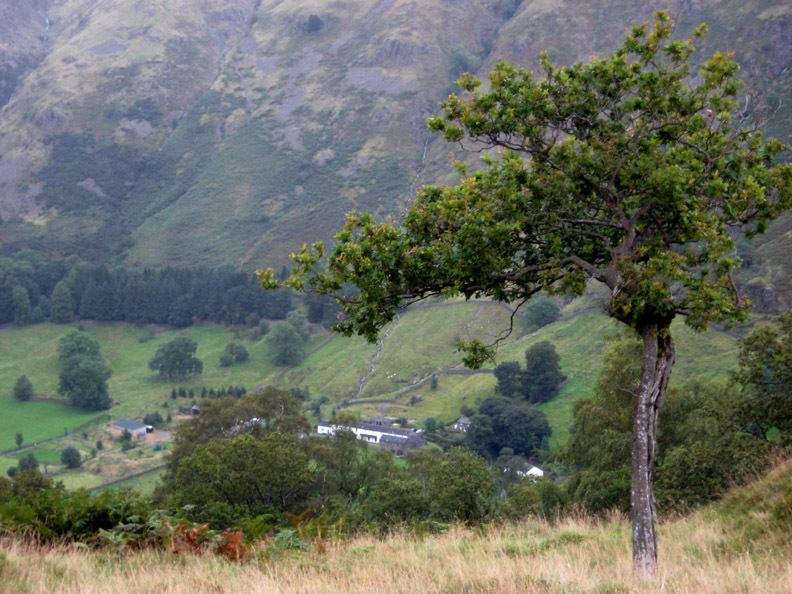 A gap in the trees and we see Thirlmere Green houses and Castle Rock. 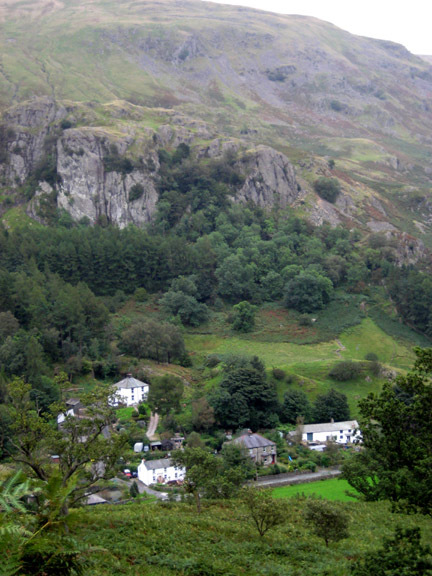 The houses further up the valley are at Stannah. 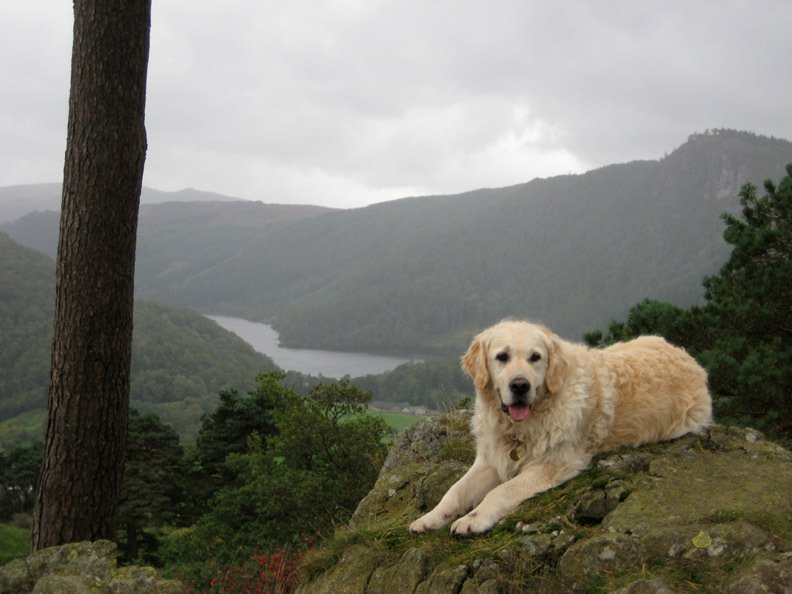 Harry sits quietly on the rock overlooking Thirlmere Reservoir with Raven Crag, the forested summit behind him. 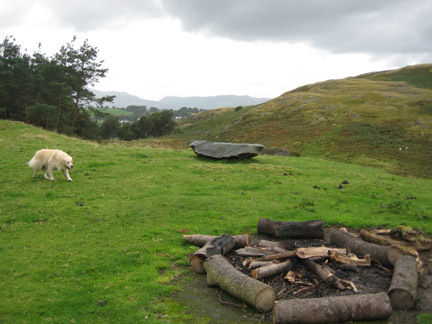 The grey misty appearance of the distant fells is an early warning of our first shower. 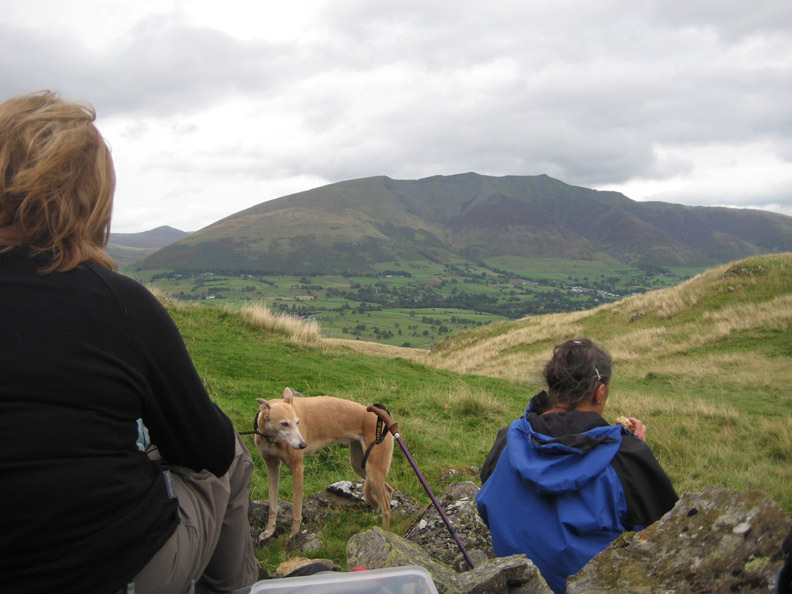 From the top of Wren Crag we look north towards the rain washed Blencathra. The weather seems to be behaving just like the forecast . . . grey and very overcast, occasionally damp. Looking over the edge, there's Fornside below. 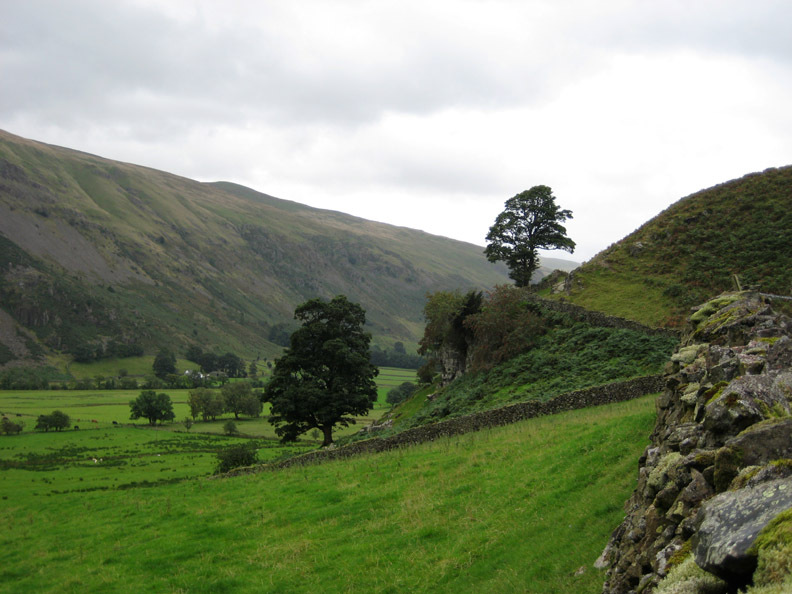 The crags of Long Band ahead as we drop down to cross the wall. Time to put on a few waterproof garments ! 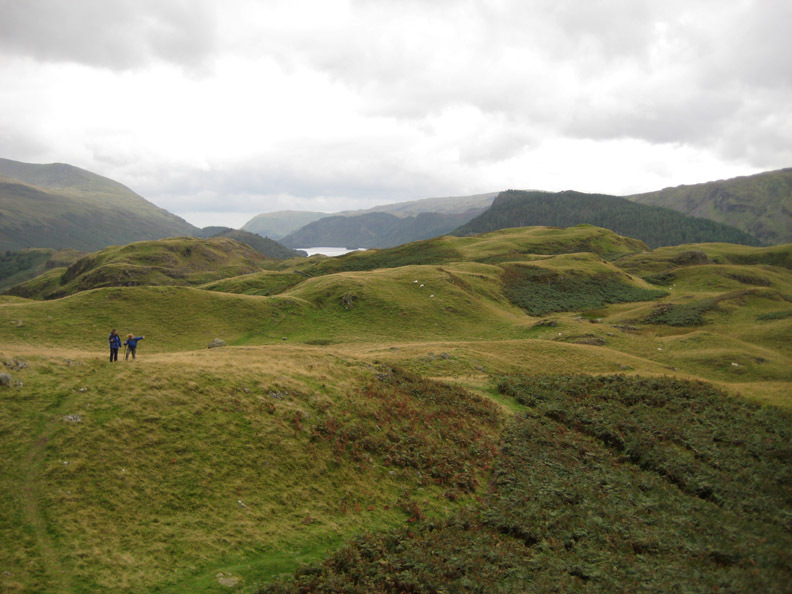 The undulating top of High Rigg with numerous small rain filled tarns. Two minutes later and the rain has passed. 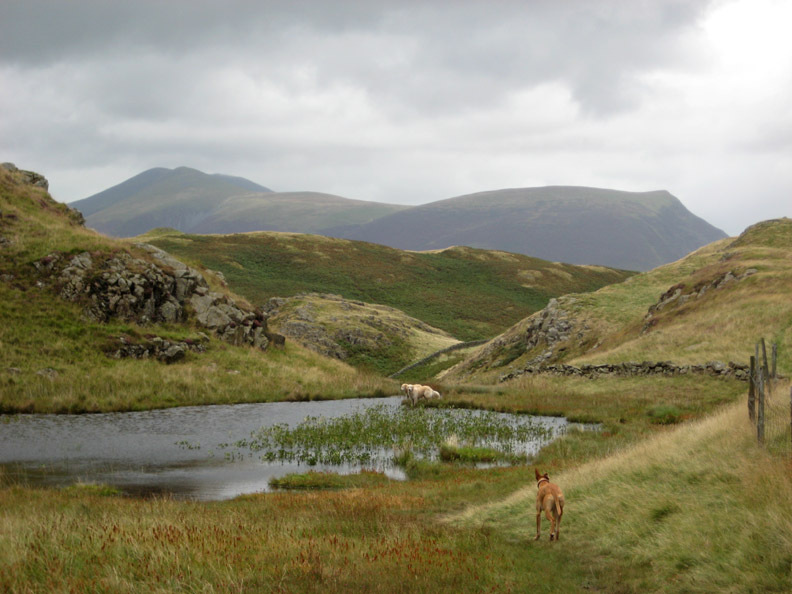 Skiddaw and Lonscale Fell behind this view of another of High Rigg's many tarns. 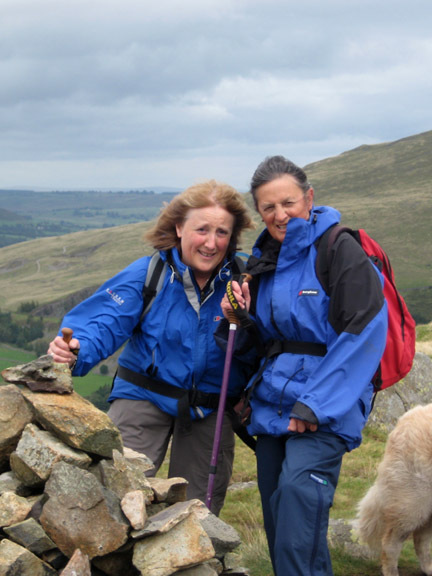 Jo and I near the summit but Ann is a little further back explaining the view to Helen. having emigrated some twenty years ago. Hold your cursor over the photo to check out the friendship. The first of two refreshment stops . 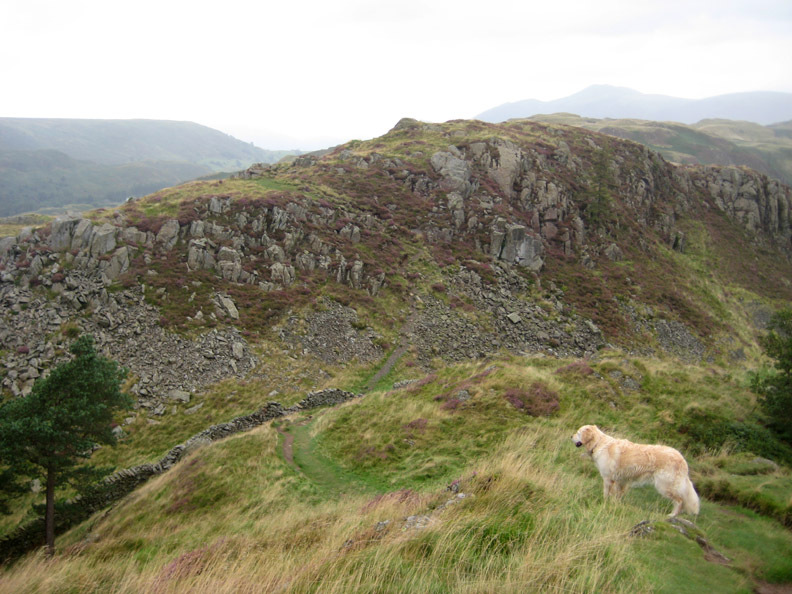 . . this one just below the summit of High Rigg. 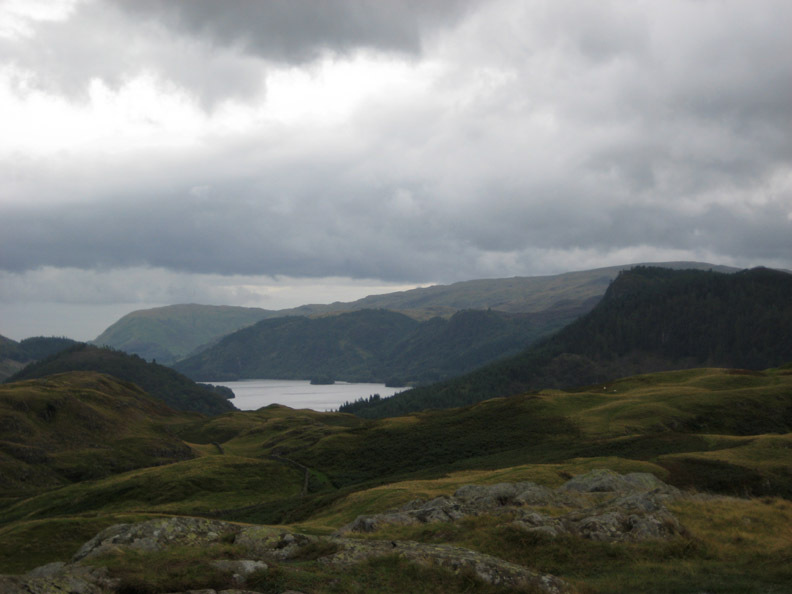 From the top looking south over Thirlmere. 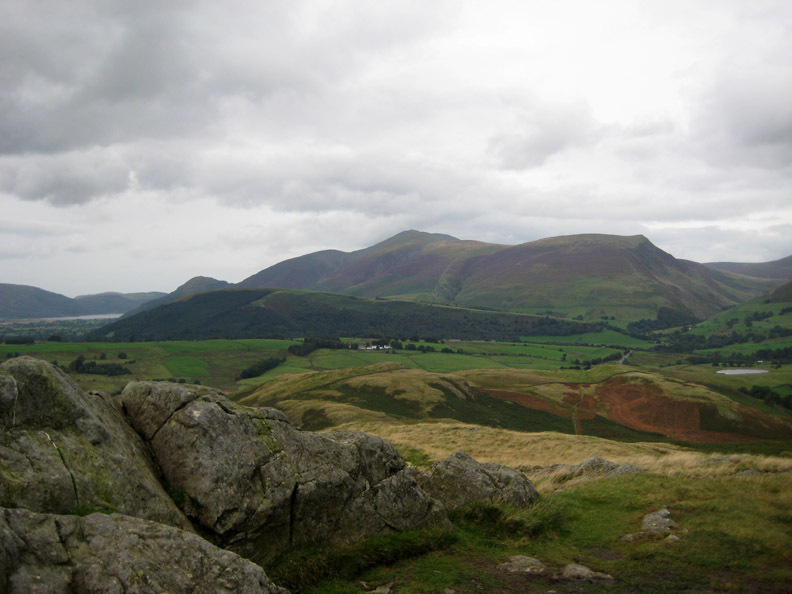 Looking north west to Latrigg, Skiddaw and Bassenthwaite. Looking northward and down to the Church and Youth Centre of St John's in the Vale. They have a campfire and a newly placed rock table. By the look of the footprints it also makes a good seat. who were much involved in the work of the youth centre below. St John's Church . 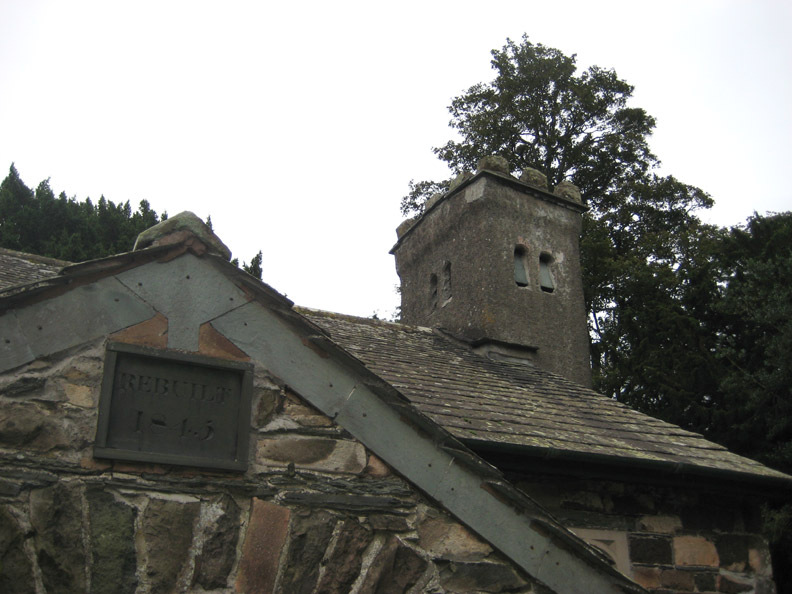 . . detail of the rebuilding plaque and the small bell tower. 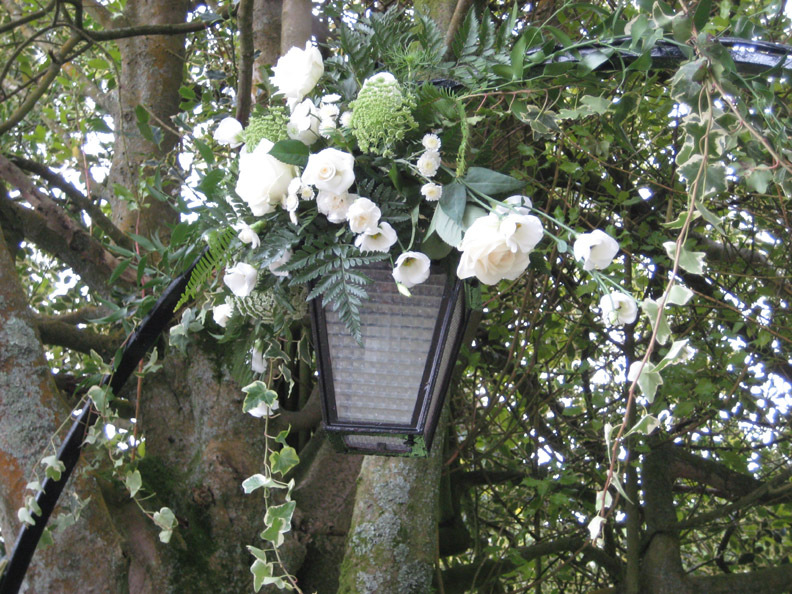 There was a wedding at the weekend and some of the lovely floral display remains over the lych gate. 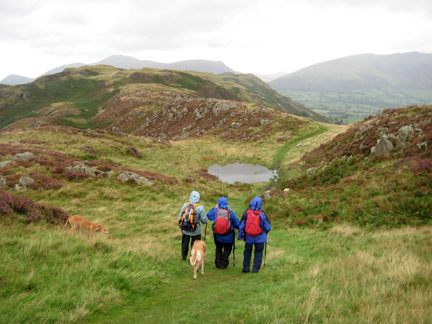 The circular walk continued by dropping down to the right and following the bridle way back under the eastern slopes of High Rigg. 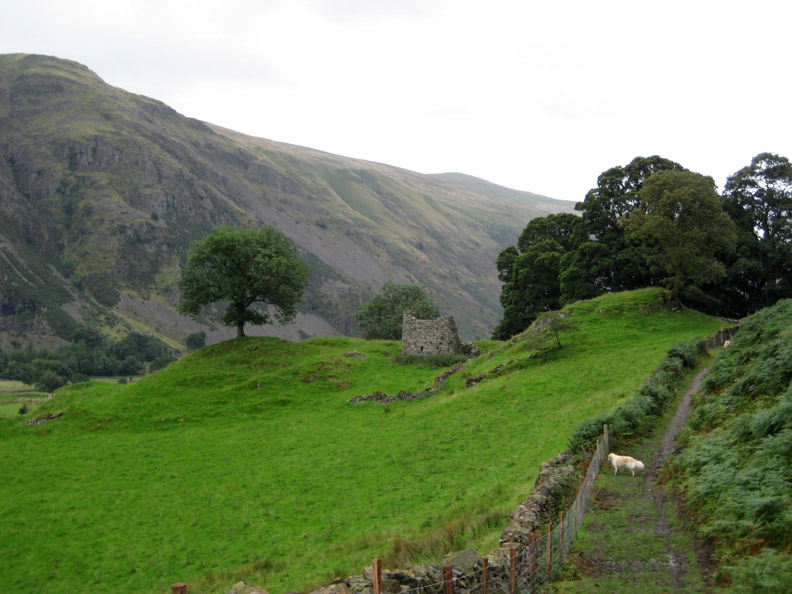 This is the remains of Rake How Farm which we pass opposite Bram Crags. 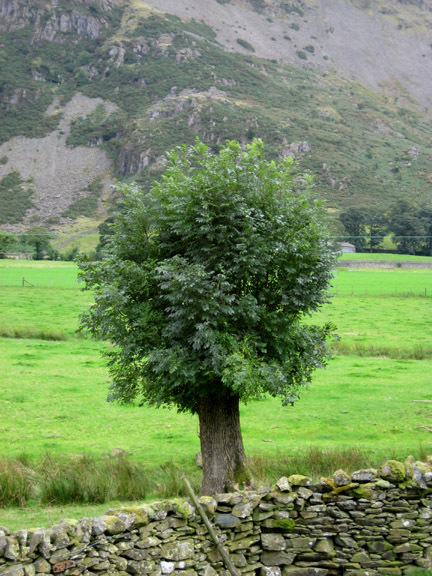 Further on, two prominent trees on another bend in the path. 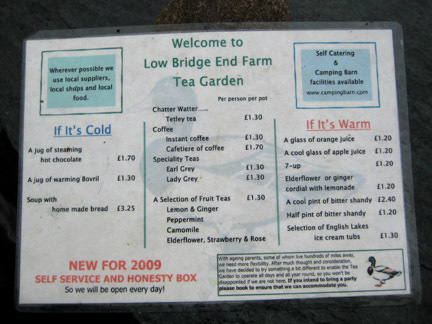 Hardly necessary following our recent lunch, but who in their right mind would pass on a visit to Low Bridgend Farm Tea Garden . . .
especially on a cool and slightly damp day like today. A jug of hot chocolate and some scones fit the bill today. The bill of fare including an advert for chicken, duck, geese and turkey eggs. 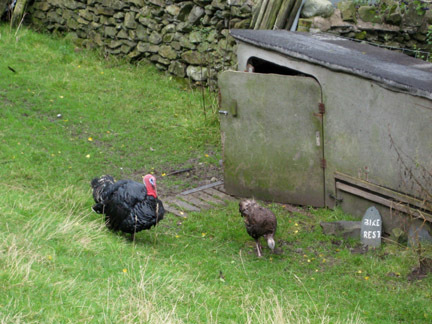 Trevor and Griselda - turkey eggs providers in season. 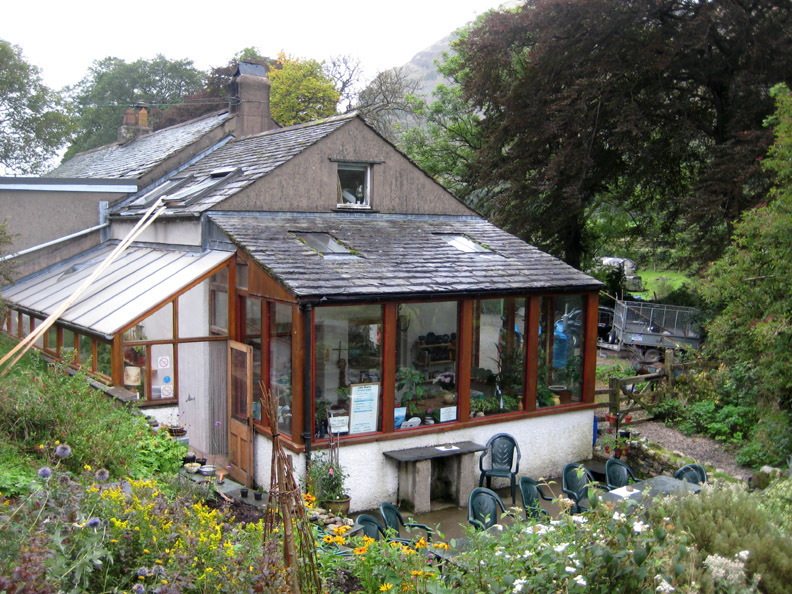 What was interesting too is that the tea room is now open every day of the year. When the boss is unavailable to serve, a kettle will be accessible for visitors to make their own tea and there's an honesty box ready to accept payments. The path continues on, climbing up through the trees again . . . and here's the three girls doing just that ! 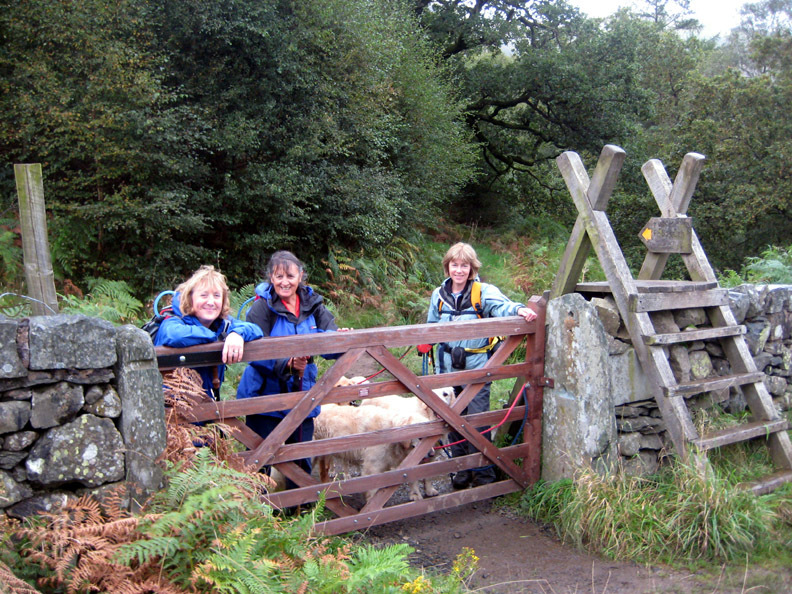 Back to the forest gate, with the dogs back on the lead before we step out onto the main road. 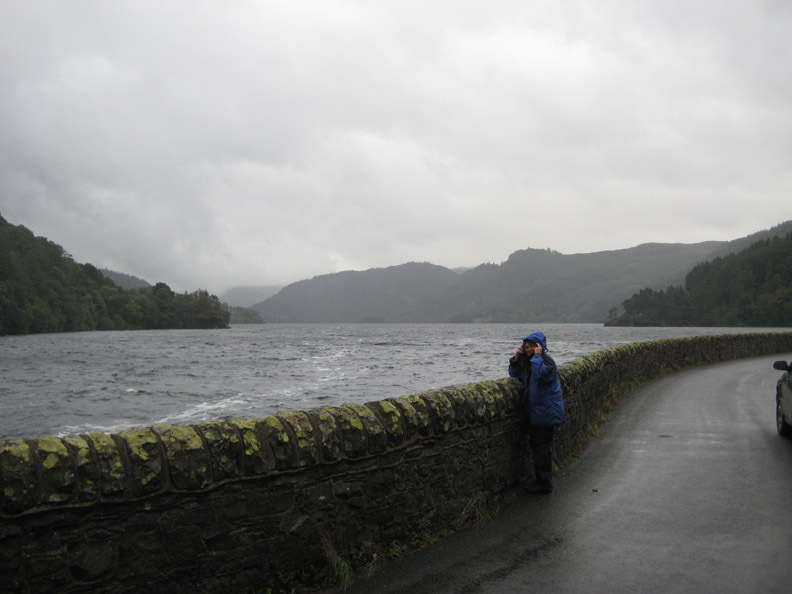 As we were so close, we took Helen over to see the Thirlmere reservoir. A steady breeze and another rain shower finds Helen sheltering under her hood again. 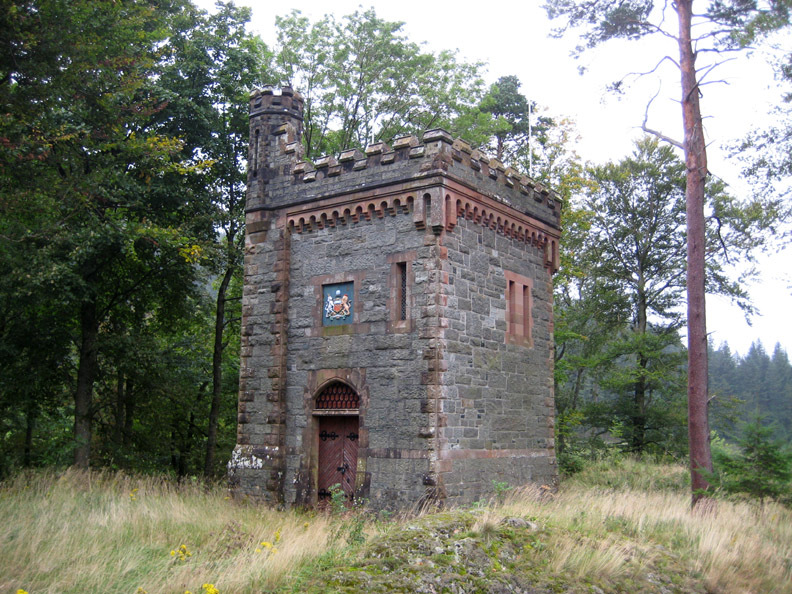 Opposite was the rather decorative Water Board tower. 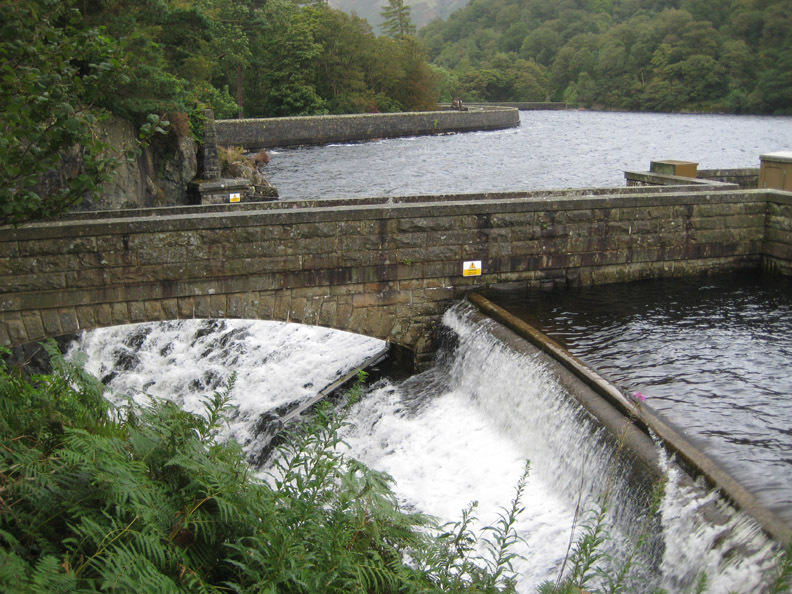 The local paper said that the water in the reservoir has reached winter levels . . . they were right. 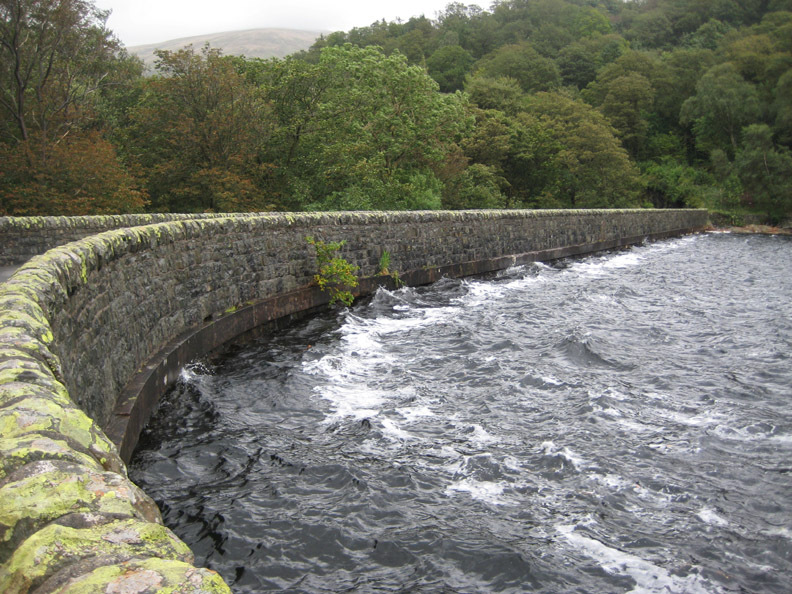 A sneak photo of the outflow which is normally hidden behind the trees. Technical note: Pictures taken with Ann's Cannon 75 Digital camera. This site best viewed with . . . that extra cuppa courtesy of Jo's Dad . . . many thanks Peter.